Nellie M, Metcalf Motor Coaster Co Ltd London. 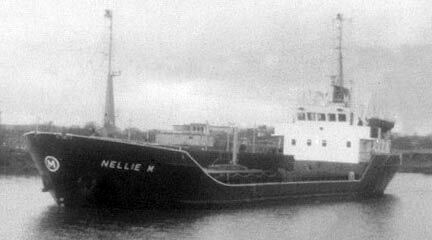 The Nellie M (O/N 343137) was built by Cochrane of Selby Yorkshire. (Yard No /1542) For the Metcalf Motor Coaster Co Ltd of London, and launched by the elder daughter of the founder of the firm in March 1972. She was 783 g.r.t 448 n.r.t. tones, and powered by an 1160 bhp Allen engine, which gave a speed on her trials of 16 knots and a service speed of 12.9 knots. 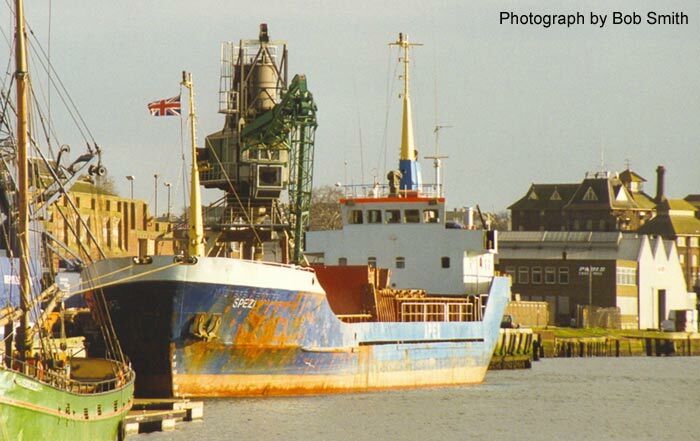 I joined her at Garston dock on the Mersey on the 6th of May 1974, she was then owned by S. William Coe & Co. Ltd. of Liverpool, She was my first coaster and only had seven of a crew. Captain, Mate, two Engineers, two A.B’s and Cook, quite a contrast from the deep sea ships that I had been on before. We carried coal mostly, from British ports to Ireland, but sometimes we would get different cargos, eg, we took a load of fertiliser from Ipswich to Galway on the west coast of Ireland, silver sand (to make Pyrex dishes) from Rotterdam to Sunderland, grain from Treeport France to Liverpool, and two huge electrical power plants (One in each of her two hatches) to Drogheda on the east coast of Ireland. I left her on the 17th of December at Invergorden Scotland. I was on her when this Nellie M photograph was taken in the summer of 1974, we were on our way up the River Bann to Coleraine, Northern Ireland, with a cargo of coal, probably from Garston. I was given this photograph of her by a ships enthusiast from Coleraine. 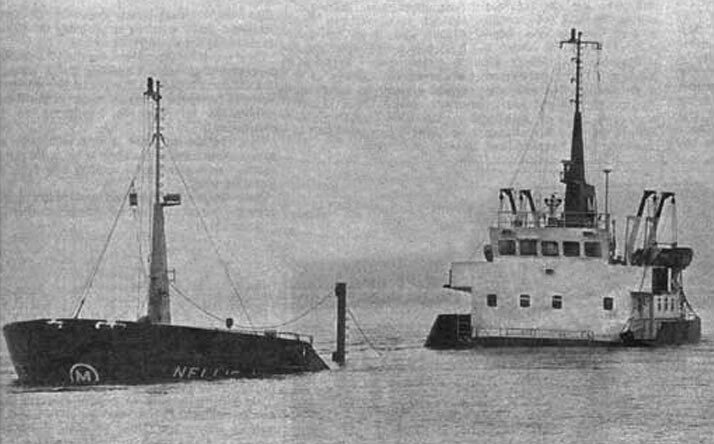 On Friday, February 6th, 1981, she was at anchor at Lough Foyle between the coasts of Co. Derry and Donegal, waiting for the tide so she could proceed up the river to Londonderry. Seven IRA men hijacked a pilot boat from Moville pilot station. Three of them planted two bombs in the engine room, while the remaining four kept watch on the crew. The crew were then told to don lifejackets and board the ships lifeboat. A line was then passed from the pilot boat to the lifeboat and it was towed. When they were near shore, the lifeboat was set adrift. Around this time, the explosions rocked the Nellie M, and another explosion sank her a little while later. None of the crew were threatened or harmed. 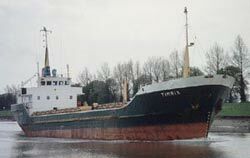 She was raised and refurbished in 1982, then sold to an Irish company re-named “Ellie” Then JR Rix & Sons Ltd of Hull bought her in 1984 and named her Timrix, she was lengthened in 1991 by approx seven meters, and No2 hatch coming was also raised about the same time. But Rix sold her in 1995. When she was re-named “Maltese Venture”, and within a year, she was sold again as the “Spezi”. In the year 2000 she crossed the Atlantic for new Columbian owners and she is still trading as the “Dove”. One great little ship. 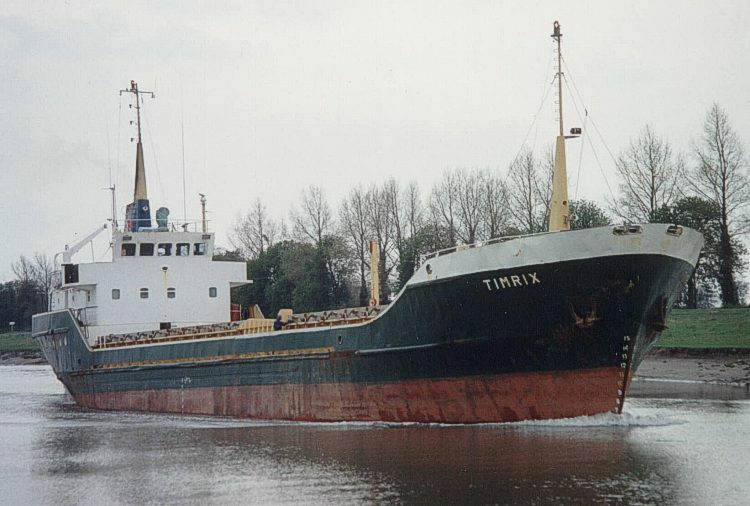 "Nellie M as the Timrix from 1984~1995" "Nellie M as the Spezi from 1996 ~ 2000"
It is interesting to note that the photo of the Timrix, shows her before she was lengthened, and had No2 hatch coming raised in 1991. Information about little Nellie after 1982, by Justin Merrigan. He was a writer for Sea Breezes for many years. and has a wealth of knowledge, and is always ready to help. He now lives and works in Hobart, Tasmania. 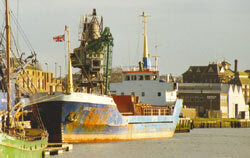 The photograph of the Spezi, shows her with the raised No 2 hatch coming, Taken by Bob Smith in Ipswich on March 18th 1997. Thanks to Justin and Bob for all their help.